This is a great display of an example of what is known as an "Emblematic Slip" (Ekman). An "Emblem" is a body language signal, who's meaning is universally or regionally recognized. A "Slip" and display of such an emblem is when it is manifested without deliberate intent (unconsciously). 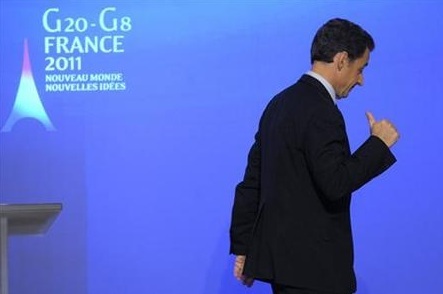 Here French President, Nicolas Sarkozy is not facing the audience and is walking away after a speech at the 2011 G20-G8 Summit - as opposed to the usual and very deliberate thumbs up which virtually all politicians (very consciously) "perform" for the audience and facing the cameras. The thumb pointed up is a (nearly) universal sign of optimism. It's presence in this moment betrays Sarkozy's feelings of cheer and confidence. Perhaps he is displaying this because he felt he performed well in his just-delivered speech or maybe it was because of the announcement today that Greek Prime Minister George Papandreou has appeared to back away from his proposal to hold referendum in December as to whether or not the European Union should bailout Greece. When the "Thumbs Up" emblem is thrust forward - in Greece this means "Up yours!". A further variation on this theme is a what is known as a "Partial Emblematic Slip" (Ekman). This is when the emblem is displayed in a limited fashion (as well as unconsciously) - e.g. only a half-way "thumbs up" and/or in an atypical position - e.g. if his hand were resting on a table or in his lap, etc. Either a partial or a full emblematic slip is a very reliable tell. It's presence is particularly valuable when the meaning of the emblem contradicts what the person is saying. When the verbal and the nonverbal are in disparity - always believe the nonverbal.